“Good night!” “Sleep well!” “I’ll see you in the morning!” All of these nightly simple and common wishes for our friends and loved ones can become mundane and void of any meaning if we are not careful. Why not shake things up a bit? Step out of your comfort zone and expose your heart, tell a joke, or wish them well to make things new. 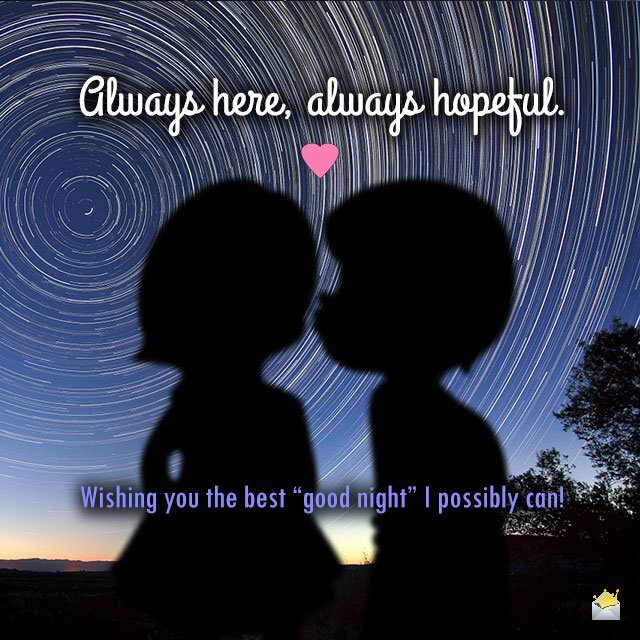 Once in a while a special good night wish is just what is needed. 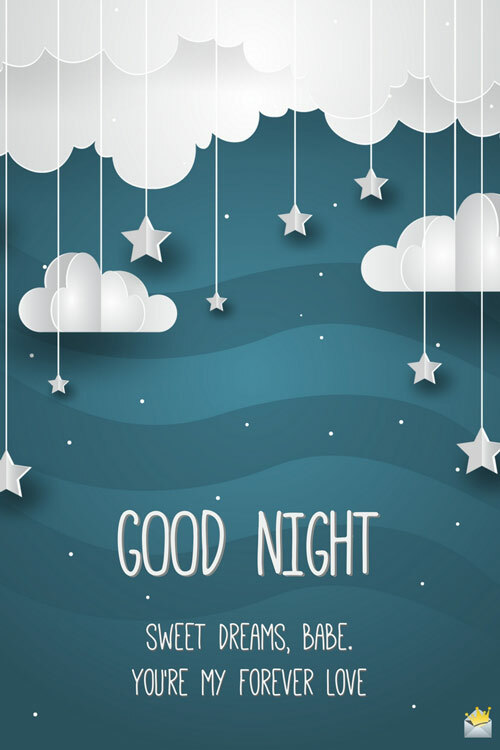 Below we have a list of entirely unique and useful good night greetings for you to use. There are sweet ones, funny ones, rhyming ones, and even romantic ones. Peruse the list and find the one (or ones) that fit you and your recipient best. Think just one by itself is too simple? Then combine two or three! This is your chance to make a positive impact in someone’s evening. Imagine them having a better night’s sleep simply because they received a note from you. What a blessing! So, whether you write this in a note, send an email, type out a text, or say it in person, your selection is sure to be a hit. Just take the time to pick the greeting you know is best. And, don’t worry about saying too much or too little. Whatever you pick will be the perfect choice. Enjoy! One more night together would be the best gift I could dream of. Nights with you are more than sweet, they are magical. Hugs and kisses, dreams and wishes. Good night to my one true love! I may not say it often, but there is never a night I do not dream of you and your beauty. Thoughts like these sustain me until the next time we see each other. Good night, sleep tight, in my dreams you never leave my sight. After a long day’s work and a day full of driving, it’s my only desire to come home and find you jiving. Let’s fall asleep in each other’s arms with the best music on the radio. Sweet dreams! How do I say good night to you? With a good night hug or a rose? Or how about a simple kiss on the nose? Distance can’t separate our love. Tonight, when you are in bed, look at the stars and think of me. I will be looking at the same stars, sharing your love. All night, I lay awake dreaming of you. My soul loves you so much that I cannot sleep. 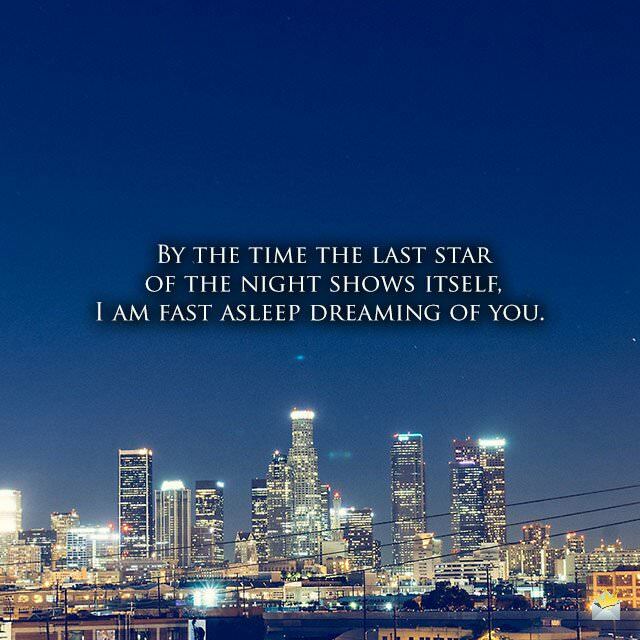 By the time the last star of the night shows itself, I am fast asleep dreaming of you. By the time the last star of the night shows itself, I am fast asleep dreaming of you. The worst part of my night is waking up. Cease your crying. My love for you is carried over time and space, so you are never truly alone. Sleep well, my sweetheart! God loves you. You can fall asleep knowing that peace and truth is in your heart. Dearest one, may the calm of night sweep over you like a soft breeze and keep you warm and peaceful all the night through. Good night to you! Did you ever notice that the morning after a night apart holds so much more energy and excitement than any other? Hoping that your sleep will be the place where our souls will soon meet, a big kiss good night. As the night calls, my soul yearns for you. Absence makes the heart grow fonder, they say. I know that is true with you. Good night, my love. Looking forward to tomorrow. Beneath the tears at night lies a desire to be with you and know you more. You are my blessing, my muse, and my best friend. Good night, dear one! Cuddle up with me, sweetheart. It’s time for us to have a good night! Daylight has ended, the moon is awake. God’s blessings to you, for goodness sake! Good night! Each day, I daydream of you. Each night I dream, too. No matter the time, you are in my thoughts. Good night to the best person I know! 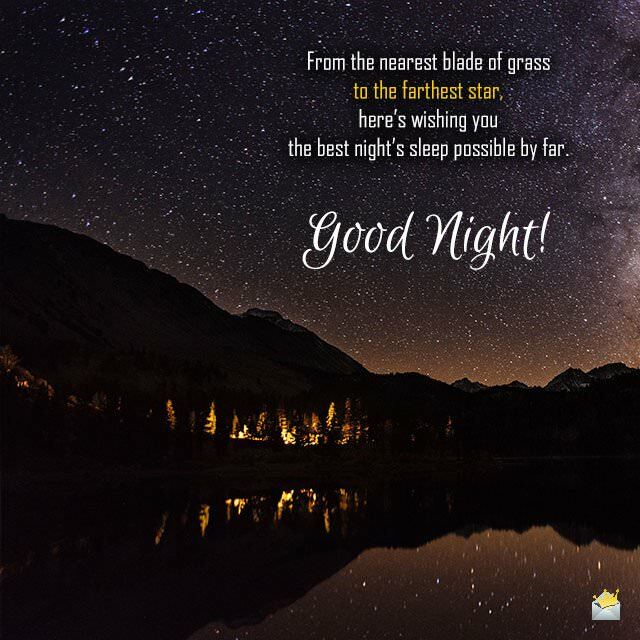 From the nearest blade of grass to the farthest star, here’s wishing you the best night’s sleep possible by far. Good night! Good night to the one who warms my heart and brings me cheer each and every day! Heaven smiles down as we sleep, warming our hearts and ticking our feet! Good night, sweet one! Inner thoughts come true in our sweetest dreams. Think hard, dream deep, and be blessed! Good night! Good night. Sleep tight. I’ll see you in the morning when the sky is bright. Good night to my dear family and friends. May the Lord bless you each day and hold you each night. Every night is a chance to recharge and a time to relax. Take a moment before you fall asleep to be thankful for this blessing and a god who interacts. Always here, always hopeful. Wishing you the best “good night” I possibly can! As the night draws near, my heart grows sad. I wish you were here with me, my lad. I love you and wish you a good night! After so many years together, how can I wish you good night in a way you haven’t heard before? I can’t find any more. So, listen to my heart beat and feel my love. Know you are blessed here on earth and from above. Since you aren’t here with me, here is a long distance hug, charge free. Good night and sleep well, my sweet husband. Roses are red. Violets are blue. Here’s a good night greeting from me to you! Roses are red. Violets are blue. I love you and I hope you know it’s true. Good night! Roses are red. Violets are blue. Good night to you and the whole crew! Roses are red. Violets are blue. Sleep well tonight until the day is anew. Good night! As the night’s slumber comes, I pray you will relax in the knowledge of being loved and cared for now and always. Although we may not see each other often, holding the ties of friendship is always important. God bless you and good night! As you fall asleep tonight, do know that you are all that my soul and heart will ever need for as long as God blesses me with life. Good night, my love. There are over 7 billion people in this world, and you alone possess the smile that brings me sunshine. I’m so blessed to have you in my life. Sleep tight tonight, sweetheart. Thanks to you sorrow has no place in my life again. There’s absolutely no one like you. And there’ll never be anyone like you. When I’m with you I feel like I’m sitting on top of the world. Babe, sleep tonight, knowing that I feel like the luckiest woman on earth because I have a phenomenal man like you I can call mine forever. Good night. As you drift into sleep, may the angels play sweet songs in your dreams tonight. I love you. There’s no ocean on earth deep enough to drown the love I have for you. Have a blissful night, my sweet love. Cuddling with you is all I want to do until the day I die. My soul and heart love you so much they always want to feel you next to them. Good night. You’re mine, and that’s all the blessing I will ever need for as long as I live. Good night, babe. Good night, my love. I hope you have the sweetest dreams ever. Honey, go to bed tonight, knowing that I’m only truly happy to be alive when I’m in your arms. I love you. Your love rules my world and fills it with all the sunshine in the universe. You shall forever be the darling of my heart. Good night. Every moment I spend in your arms is more precious to me than the most precious diamond in the universe. Go to bed tonight, knowing that my heart is yours forever. The words in the English dictionary are not enough to tell you how much my soul pines for your love. Babe, since nothing lasts forever, I want our love to be nothing so it can last forever. Good night. May God cover you with a sheet of clouds and give you the most pleasant of dreams as you sleep tonight. I hope your night is as blissful as your love is to me. Sleep tight, honey. Babe, as you give yourself some rest this lovely night, do know that every single day you do a billion things that put a smile on my face. I love you so much. Good night. I don’t think you realize how instrumental your love is to my happiness. You are truly my paradise. Good night. You deserve all the happiness in the world for giving me your love, and that’s why tonight as you sleep, I pray that the heavenly angels will play songs that bring you bright and sweet dreams. Good night. In my eyes, you are the sunshine and all that’s beautiful in this universe. Good night, sweetheart. Sending a good night hug to the love of my life. I can’t wait to see you and spend time with you in my dreams. Even all the love quotes in the world will never be enough to express my love for you. So tonight, I thank you from the bottom of my heart for agreeing to be in my life and decorating it. Sleep well, my love. Good night, sweetheart. I’m hoping that your sleep will be blessed with pleasant dreams. Love you. As you sleep, may the angels play the sweetest songs in heaven for you. Goodnight, darling. You have no idea how much I enjoy and appreciate your presence in my life. You’re my everything. May God bring you bright dreams tonight. No amount of water on earth or in heaven can ever quench the fire burning in my heart for you. I will love you until time comes to an end. Good night, and sweet dreams, my darling. I hope to meet you in my dreams and kiss you until my lips get sour. Have a blissful night, my love. Not all the sweetest good night wishes in this world can ever fill my heart with joy like a single word from you does. There’s no ocean I wouldn’t swim across for the love of you. Have a pleasant night. Wishing the Queen of my heart a good night sleep. Sweetheart, I never knew true happiness until you began reigning as my Queen. As you nestle your head on your pillow to get a good night’s rest, may the Lord instruct His angels to play sweet songs that bring you every pleasant dream in the universe. Good night. Babe, if I had God’s powers, I would prepare clouds for your bed tonight so that your sleep may be accompanied by only the most beautiful dreams in paradise. Good night. Every moment I spend with you is nothing short of a dream come true. Have a sweet night. Tonight, may angels surround your bed and bright crystals illuminate your path to beautiful dreams. Good night. There’s nothing more precious to me in this world than the fact that I am spending my life with a wonderful girl/woman like you. Good night, my angel. Good night. Sweet dreams, babe. You’re my forever love. I have something that all the money in the world can’t buy because I have your love. Babe, I wish you a night that is as wonderful as you are. You are my everything, and I will love you until the last star in space dies. I hope that someday I can make your soul feel as good as you make mine feel. Good night, my sunshine. You make all my dreams come true, and that is why for your happiness, I will walk to the end of the world and climb to the peak of the highest mountain on earth. Sweetheart, I believe in you like I believe in no one else. So embrace your dreams and never let anyone discourage you from chasing after them. Having you in my life is the greatest honor of my life. May we never drift apart. Good night.